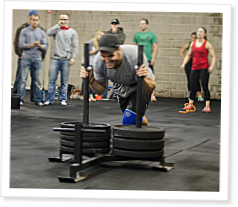 Relatively cheap and easily available, sleds are a versatile option for CrossFit gyms. Pulling or pushing a sled is like getting smacked with a baseball bat through a phone book: It hurts like hell but doesn’t leave much of a mark. Long preferred by powerlifters and others for their ability to ramp up workload without creating excessive soreness, sleds might have been considered premium items in the early days of CrossFit, when it was far more difficult to procure equipment. For example, they don’t appear in the seminal CrossFit Journal article “The Garage Gym” by CrossFit Founder and CEO Greg Glassman. Even today, with a wide variety of economical push/pull equipment on the market, sleds aren’t as essential as barbells, squat racks or pull-up bars. But they are tremendously functional and very effective. They’re also a lot of fun if you’re into staggering around the gym trying to figure out why your lungs are burning and your legs stopped working. Is “Punishment” a Dirty Word? Why Use a Training Log? Mike Warkentin visits with CrossFit’s finest coaches at the recent Trainers Summit. Glen Harrison says the benefits of a log book aren’t just about seeing shorter WOD times but creating a record of information that provides answers. I've been using the prowler steadily since 2010. I have a 75' asphalt driveway, so that is our course. I have also used the sled as a "timer" for team events. One team is completing one or two movements while the other team moves the prowler up and back on the driveway. The prowler shuttle run may be the most devastating thing we have done. The sled passes the 25' line and returns, the 50' line and returns and then the full 75' and return.. Each athlete tries to build to the max weight through this shuttle run in less than 60 seconds.. You won't be able to make many attempts at this.. I usually have athletes try one attempt/day..